Capacity: Toe - 5 Ton. 10 Ton, Top - 20 Ton. Support feet provide extra stability. The HIlman Toe Jacks allow you to get under and lift equipment with just over 1″ of ground clearance (1.06″ to be exact) and since there are lifting points on both the toe and the top of the jack these are the perfect complement to Hilman Rollers. We are offering Toe Jacks to our clients. In order to become one of the preferred commercial choices, we are engaged in providing for our customers, Hydraulic Toe Jack. Slide Table with RollerThis model enables you to handle fine position adjustment in any of the three directions. - This model consists of an F-series jack and wheels that are made of urethane, enabling fine position adjustment in three directions, forward/backward, left/right and up/down while keeping the load in a jacked position. We are one of the prestigious Toe Jacks Manufacturers and Suppliers from India. 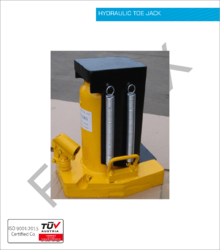 Our Toe Jack is manufactured using the finest quality raw material, which makes it sturdy in construction and rust free. 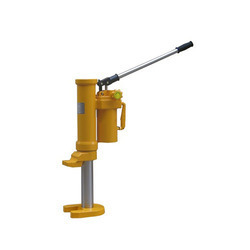 Our TJ Hydraulic Toe Jack finds application in various industries due to its excellent performance and high strength.